In this election year, the question of voting restrictions is once again receiving great public attention. This report is intended to update and expand our previous work on the scope and distribution of felony disenfranchisement in the United States (see Uggen, Shannon, and Manza 2012; Uggen and Manza 2002; Manza and Uggen 2006). The numbers presented here represent our best assessment of the state of felony disenfranchisement as of the November 2016 election. To compile estimates of disenfranchised populations, we take into account new U.S. Census data on voting age populations and recent changes in state-level disenfranchisement policies, including those reported in Expanding the Vote: State Felony Disenfranchisement Reform, 1997-2010 (Porter 2010). For example, in 2007, Maryland repealed its lifetime voting ban that had applied to some individuals post-sentence, and in 2016 eliminated the voting ban for persons on probation or parole. Other states have revised their waiting periods and streamlined the process for regaining civil rights. As shown in the following table, Maine and Vermont remain the only states that allow persons in prison to vote. Thirty U.S. states deny voting rights to felony probationers, and thirty-four states disenfranchise parolees. In the most extreme cases, twelve states continue to deny voting rights to some or all of the individuals who have successfully fulfilled their prison, parole, or probation sentences (for details, see notes to Table 1). 2. Arizona – Permanently disenfranchises persons with two or more felony convictions. 3. California – In 2016, legislation restored voting rights to people convicted of a felony offense housed in jail, but not in prison. 4. Delaware – The 2013 Hazel D. Plant Voter Restoration Act removed the five-year waiting period. People convicted of a felony, with some exceptions, are now eligible to vote upon completion of sentence and supervision. People who are convicted of certain disqualifying felonies – including murder, bribery, and sexual offenses – are permanently disenfranchised. 5. Iowa – Governor Tom Vilsack restored voting rights to individuals who had completed their sentences via executive order on July 4, 2005. Governor Terry Branstad reversed this executive order on January 14, 2011 returning to permanent disenfranchisement for persons released from supervision after that date. 6. Maryland – Eliminated the ban on voting for persons on probation or parole supervision in 2016. 7. Nebraska – Reduced its indefinite ban on post-sentence voting to a two-year waiting period in 2005. 8. Nevada – Disenfranchises people convicted of one or more violent felonies and people convicted of two or more felonies of any type. 9. Tennessee – Disenfranchises those convicted of certain felonies since 1981, in addition to those convicted of select crimes prior to 1973. Others must apply to Board of Probation and Parole for restoration. 10. Rhode Island – A 2006 ballot referendum eliminated the ban on voting for persons on probation or parole supervision. 11. South Dakota – State began disenfranchising people on felony probation in 2012. 12. Virginia – When the Virginia Supreme Court overturned Governor Terry McAuliffe’s blanket restoration of voting rights for people who had completed their sentences, he individually approved voting rights for 12,832 individuals in August, 2016. 13. Wyoming – Voting rights restored after five years to people who complete sentences for first-time, non-violent felony convictions in 2016 or after. We estimated the number of people released from prison and those who have completed their terms of parole or probation based on demographic life tables for each state, as described in Uggen, Manza, and Thompson (2006) and Shannon et al. (2011). We modeled each state’s disenfranchisement rate in accordance with its distinctive felony voting policies, as described in Table 1. For example, some states impose disenfranchisement for five years after release from supervision, some states only disenfranchise those convicted of multiple felonies, and some only disenfranchise those convicted of violent offenses.1)In Florida, some can avoid a formal felony conviction by successfully completing a period of probation. According to the Florida Department of Law Enforcement, as much as 40 percent of the total probation population holds this “adjudication withheld” status. According to reports by the Bureau of Justice Statistics, only about 50 percent of Florida probationers successfully complete probation. In light of this, we reduce the annual current disenfranchised felony probation numbers by 40 percent and individuals disenfranchised post-sentence by 20 percent (.4*.5=.20) in each year in the life tables. In brief, we compiled demographic life tables for the period 1948-2016 to determine the number of released individuals lost to recidivism (and therefore already included in our annual head counts) and to mortality each year. This allows us to estimate the number of individuals who have completed their sentences in a given state and year who are no longer under correctional supervision yet remain disenfranchised. Because data on correctional populations are currently available only through year-end 2014, we extended state-specific trends from 2013-2014 to obtain estimates for 2016. Our duration-specific recidivism rate estimates are derived from large-scale national studies of recidivism for prison releasees and probationers. Based on these studies, our models assume that most released individuals will be re-incarcerated (66 percent) and a smaller percentage of those on probation or in jail (57 percent) will cycle back through the criminal justice system. We also assume a substantially higher mortality rate for people convicted of felony offenses relative to the rest of the population. Both recidivists and deaths are removed from the post-sentence pool to avoid overestimating the number of individuals in the population who have completed their sentences. Each release cohort is thus reduced each successive year – at a level commensurate with the age-adjusted hazard rate for mortality and duration-adjusted hazard rate for recidivism – and added to each new cohort of releases. Overall, we produced more than 200 spreadsheets covering 68 years of data.2)Our data sources include numerous United States Department of Justice (DOJ) publications, including the annual Sourcebook of Criminal Justice Statistics, Probation and Parole in the United States, as well as the Prisoners and Jail Inmates at Midyear series. Where available, we used data from state departments of corrections rather than national sources, as in the case of Minnesota. For early years, we also referenced National Prisoner Statistics, and Race of Prisoners Admitted to State and Federal Institutions, 1926-1986. We determined the median age of released prisoners based on annual data from the National Corrections Reporting Program. The recidivism rate we use to decrease the releasee population each year is based upon the Bureau of Justice Statistics (1989) “Recidivism of Prisoners Released in 1983” study and “Recidivism of Felons on Probation 1986-1989.” For those in prison or on parole, we use a reincarceration rate of 18.6% at one year, 32.8% at two years, 41.4% at 3 years. Although rearrest rates have increased since 1983, the overall reconviction and reincarceration rates used for this study are much more stable (Langan and Levin 2002, p. 11). For those on probation or in jail, the corresponding three-year failure rate is 36%, meaning that individuals are in prison or jail and therefore counted in a different population. To extend the analysis to subsequent years, we calculated a trend line using the ratio of increases provided by Hoffman and Stone-Meierhoefer (1980) on federal prisoners. By year 10, we estimate a 59.4% recidivism rate among released prisoners and parolees, which increases to 65.9% by year 62 (the longest observation period in this analysis). Because these estimates are higher than most long-term recidivism studies, they are likely to yield conservative estimates of the ex-felon population. We apply the same trend line to the 3-year probation and jail recidivism rate of 36%; by year 62, the recidivism rate is 57.3%. 1948 is the earliest year for which detailed data are available on releases from supervision. These provide the figures needed to compile disenfranchisement rate estimates that are keyed to the appropriate correctional populations for each state and year. Figure 1 shows the distribution of the 6.1 million disenfranchised individuals across correctional populations. People currently in prison and jail now represent less than one-fourth (23 percent) of those disenfranchised. The majority (77 percent) are living in their communities, having fully completed their sentences or remaining supervised while on probation or parole. Due to differences in state laws and rates of criminal punishment, states vary widely in the practice of disenfranchisement. The maps and tables below represent the disenfranchised population as a percentage of the adult voting age population in each state. As noted above, we estimate that 6.1 million Americans are currently ineligible to vote by state law. As Figure 2 and the statistics in Table 3 show, state-level disenfranchisement rates in 2016 varied from less than .5 percent in Massachusetts, Maryland, New Hampshire, North Dakota, Oregon, Rhode Island, and Utah (and zero in Maine and Vermont) to more than 7 percent in Alabama, Florida, Kentucky, Mississippi, Tennessee, and Virginia. These figures show significant growth in recent decades, even as many states began to dismantle voting restrictions for formerly disenfranchised populations. Figure 3 displays disenfranchisement rates in 1980, retaining the same scale as in Figure 2. At that time, far more of the nation had disenfranchisement rates below .5 percent and no state disenfranchised more than 5 percent of its adult citizens. The cartogram in Figure 4 provides another way to visualize the current state of American disenfranchisement, highlighting the large regional differences in felony disenfranchisement laws and criminal punishment. Cartograms distort the land area on the map according to an alternative statistic, in this case the total felony disenfranchisement rate. Southeastern states that disenfranchise hundreds of thousands of people who have completed their sentences, such as Florida, Kentucky, and Virginia, appear bloated in the cartogram. In contrast, the many Northeastern and Midwestern states that only disenfranchise individuals currently in prison shrivel in size. This distorted map thus provides a clear visual representation of the great range of differences in the scope and impact of felony disenfranchisement across the 50 states. Figure 5 illustrates the historical trend in U.S. disenfranchisement, showing growth in the disenfranchised population for selected years from 1960 to 2016. The number disenfranchised dropped from approximately 1.8 million to 1.2 million between 1960 and 1976, as states expanded voting rights in the civil rights era. Many states have continued to pare back their disenfranchisement provisions since the 1970s (see Behrens, Uggen, and Manza, 2003; Manza and Uggen, 2006). Nevertheless, the total number banned from voting continued to rise with the expansion in U.S. correctional populations. The total disenfranchised population rose from 3.3 million in 1996 to 4.7 million in 2000, to 5.4 million in 2004, to 5.9 million in 2010. Today, we estimate that 6.1 million Americans are disenfranchised by virtue of a felony conviction. Disenfranchisement rates vary tremendously across racial and ethnic groups, such that felony disenfranchisement provisions have an outsized impact on communities of color. Race and ethnicity have not been consistently collected or reported in the data sources used to compile our estimates, so our ability to construct race-specific estimates is limited. This is especially problematic for Latinos, who now constitute a significant portion of criminal justice populations. Nevertheless, we used the most recent data available from the Bureau of Justice Statistics to develop a complete set of state-specific disenfranchisement estimates for the African American voting age population, as shown in Figures 6 and 7. We first show a map of the African American disenfranchisement rate for 1980, and then show how the picture looks today. By 1980, the African American disenfranchisement rate already exceeded 10 percent of the adult population in states such as Arizona and Iowa, as shown in Figure 6. The figure also indicates that several Southeastern states disenfranchised more than 5 percent of their adult African American populations at that time. Figure 7 shows the corresponding rates for 2016, again retaining a common scale and shading to keep the map consistent with the 1980 map in Figure 6. African American disenfranchisement rates in Kentucky, Tennessee, and Virginia now exceed 20 percent of the adult voting age population. Whereas only 9 states disenfranchised at least 5 percent of their African American adult citizens in 1980, 23 states do so today. The rate of total individuals disenfranchised in 2016 (2.47 percent) is quite similar to the 2010 figures reported by Uggen et al. for 2012 (2.50 percent) and Manza and Uggen in 2006 (2.42 percent), despite state changes in disenfranchisement policy and population growth. Our estimates for African American disenfranchisement in 2016, however, are slightly lower than those for 2010 – 7.44 percent versus 7.66 percent, and for 2004, 8.25 percent. For these estimates, we used the most inclusive denominator for the African American voting age population available from the U.S. Census to ensure that we do not over estimate the disenfranchisement rate for this population. While growth in the baseline population for African Americans contributes to the decline in the disenfranchisement rate from previous estimates, the lion’s share of the difference is due to an important refinement in our estimation procedures. For 2016 and for 2010, we used race-specific recidivism rates (resulting in a higher rate for African Americans) that more accurately reflect current scholarship on recidivism. This results in a higher rate of attrition in our life tables, but produces a more conservative and, we believe, more accurate portrait of the number of disenfranchised African Americans. Though lower than in 2004, the 7.44 percent rate of disenfranchisement for African Americans remains four times greater the non-African American rate of 1.78 percent. Given the size of Florida’s disenfranchised population, we also note our estimation procedure for this state. Based on a state-specific recidivism report in 1999, our 2004 estimates included much higher recidivism rates for African Americans in Florida (up to 88% lifetime). A 2010 report from the Florida Department of Corrections shows that rates of recidivism for African Americans are now more closely in line with the national rates we apply to other states. In light of this more recent evidence, we begin applying our national rate of recidivism for African Americans (up to 73% lifetime) to Florida’s African American population with prior felony convictions from 2005 onward. In 2016, more people were disenfranchised in Florida than in any other state and Florida’s disenfranchisement rate remains highest among the 50 states. As Table 1 noted, there have been several significant changes in state disenfranchisement policies over the past decade. Most notably, Delaware removed its five-year waiting period for most offenses in 2013 and South Dakota began disenfranchising felony probationers in 2012. Governor Tom Vilsack of Iowa re-enfranchised all state residents who had completed their sentences by executive order on July 4, 2005 – though that order was then reversed by his successor, Governor Terry Branstad, in January 2011. In 2016 the Alabama legislature eased the rights restoration process after completion of sentence for persons not convicted of a crime of “moral turpitude.” Other states have also reduced disenfranchisement through streamlining restoration of rights or re-enfranchising certain groups of individuals with felony convictions. For example, both Rhode Island and Maryland now restrict voting rights only for those in prison as opposed to all individuals currently serving a felony sentence, including those on probation and parole. And in 2016, California restored voting rights to people convicted of a felony offense housed in jail, but not in prison. Our intent here is to provide a portrait of disenfranchisement that would be accurate as of the 2016 November election, though we stress that all data reported here are estimates rather than head counts. States typically provide some limited mechanism for disenfranchised persons to restore their right to vote. These vary greatly in scope, eligibility requirements, and reporting practices. It is thus difficult to obtain consistent information about the rate and number of disenfranchised Americans whose rights are restored through these procedures. Nevertheless, we contacted each of the appropriate state agencies by email and phone and compiled the information they made available to us in Table 2. This provides some basic information about the frequency of state restoration of rights in those 12 states that disenfranchise beyond sentence completion. The table shows how many people were disenfranchised and the number of restorations reported by state officials in a given reporting period. While we were unable to obtain complete data from all states, we subtracted all known restorations of civil rights (including full pardons) from each state’s total disenfranchised post-sentence figure. Even accounting for these restorations, it is clear that the vast majority of such individuals in these states remain disenfranchised. Indeed, some states have significantly curtailed restoration efforts since 2010, including Iowa and Florida. This report provides new state-level estimates on felony disenfranchisement for 2016 in the United States to update those provided by Uggen, Shannon, and Manza (2012) for previous years. In Tables 3 and 4, we provide state-specific point estimates of the disenfranchised population and African American disenfranchised population, subject to the caveats described below. Despite significant legal changes in recent decades, over 6.1 million Americans remained disenfranchised in 2016. When we break these figures down by race, it is clear that disparities in the criminal justice system are linked to disparities in political representation. The distribution of disenfranchised individuals shown in Figure 1 also bears repeating: less than one-fourth of this population is currently incarcerated, meaning that about 4.7 million adults who live, work, and pay taxes in their communities are banned from voting. Of this total, over one million are African Americans who have completed their sentences. Public opinion research shows that a significant majority of Americans favor voting rights for people on probation or parole who are currently supervised in their communities, as well as for individuals who have completed their sentences (Manza, Brooks, and Uggen 2004). How much difference would it make if state laws were changed to reflect the principles most Americans endorse? The answer is straightforward: Voting rights would be restored to 77 percent of the 6.1 million people currently disenfranchised. We have taken care to produce estimates of current populations and “post-sentence” populations that are reliable and valid by social science standards. Nevertheless, readers should bear in mind that our state-specific figures for the 12 states that bar individuals from voting after they have completed their sentences remain point estimates rather than actual head counts. In addition, the prison, probation, parole, and jail populations we report for 2016 are also estimated, based on the recent state-specific trends in each state. In other work, we have presented figures that adjust or “bound” these estimates by assuming different levels of recidivism, inter-state mobility, and state-specific variation. With these caveats in mind, the results reported here present our best account of the prevalence of U.S. disenfranchisement in 2016. These estimates will be adjusted if and when we discover errors or omissions in the data compiled from individual states, U.S. Census and Bureau of Justice Statistics sources, or in our own spreadsheets and estimation procedures. Florida Department of Corrections. 2010. “2009 Florida Prison Recidivism Study: Releases from 2001 to 2008.” Florida Department of Corrections: Bureau of Research and Data Analysis. Manza, Jeff and Christopher Uggen. 2006. Locked Out: Felon Disenfranchisement and American Democracy. New York: Oxford University Press. Manza, Jeff, Clem Brooks, and Christopher Uggen. 2004. “Public Attitudes toward Felon Disenfranchisement in the United States.” Public Opinion Quarterly 68:275-86. Porter, Nicole D. 2010. “Expanding the Vote: State Felony Disenfranchisement Reform, 2010.” The Sentencing Project, Washington DC. Shannon, Sarah, Christopher Uggen, Melissa Thompson, Jason Schnittker, and Michael Massoglia. 2011. “Growth in the U.S. Ex-Felon And Ex-Prisoner Population, 1948 to 2010.” Paper presented at the 2011 Annual Meetings of the Population Association of America. Uggen, Christopher, Jeff Manza, and Melissa Thompson. 2006. “Citizenship, Democracy, and the Civic Reintegration of Criminal Offenders.” Annals of the American Academy of Political and Social Science 605:281-310. Uggen, Christopher and Jeff Manza. 2002. “Democratic Contraction? The Political Consequences of Felon Disenfranchisement in the United States.” American Sociological Review 67:777-803. Uggen, Christopher, Sarah Shannon, and Jeff Manza. 2012. 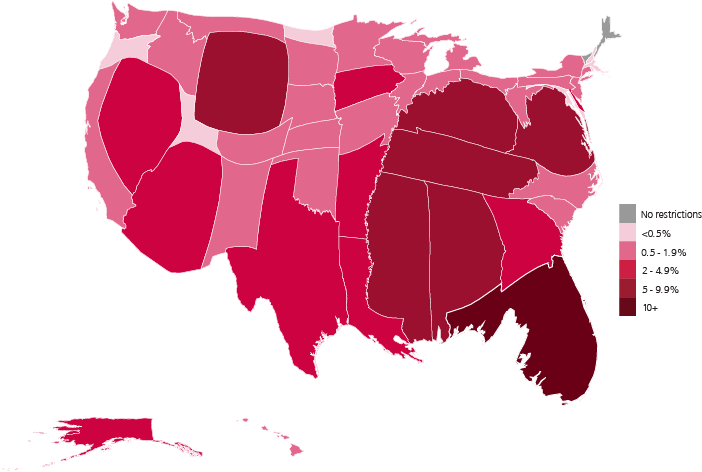 State-level Estimates of Felon Disenfranchisement in the United States, 2010. Washington, DC: Sentencing Project. We thank Lesley Schneider and Chelsea Carlson for research assistance. 1. ↑ In Florida, some can avoid a formal felony conviction by successfully completing a period of probation. According to the Florida Department of Law Enforcement, as much as 40 percent of the total probation population holds this “adjudication withheld” status. According to reports by the Bureau of Justice Statistics, only about 50 percent of Florida probationers successfully complete probation. In light of this, we reduce the annual current disenfranchised felony probation numbers by 40 percent and individuals disenfranchised post-sentence by 20 percent (.4*.5=.20) in each year in the life tables. 2. ↑ Our data sources include numerous United States Department of Justice (DOJ) publications, including the annual Sourcebook of Criminal Justice Statistics, Probation and Parole in the United States, as well as the Prisoners and Jail Inmates at Midyear series. Where available, we used data from state departments of corrections rather than national sources, as in the case of Minnesota. For early years, we also referenced National Prisoner Statistics, and Race of Prisoners Admitted to State and Federal Institutions, 1926-1986. We determined the median age of released prisoners based on annual data from the National Corrections Reporting Program. The recidivism rate we use to decrease the releasee population each year is based upon the Bureau of Justice Statistics (1989) “Recidivism of Prisoners Released in 1983” study and “Recidivism of Felons on Probation 1986-1989.” For those in prison or on parole, we use a reincarceration rate of 18.6% at one year, 32.8% at two years, 41.4% at 3 years. Although rearrest rates have increased since 1983, the overall reconviction and reincarceration rates used for this study are much more stable (Langan and Levin 2002, p. 11). For those on probation or in jail, the corresponding three-year failure rate is 36%, meaning that individuals are in prison or jail and therefore counted in a different population. To extend the analysis to subsequent years, we calculated a trend line using the ratio of increases provided by Hoffman and Stone-Meierhoefer (1980) on federal prisoners. By year 10, we estimate a 59.4% recidivism rate among released prisoners and parolees, which increases to 65.9% by year 62 (the longest observation period in this analysis). Because these estimates are higher than most long-term recidivism studies, they are likely to yield conservative estimates of the ex-felon population. We apply the same trend line to the 3-year probation and jail recidivism rate of 36%; by year 62, the recidivism rate is 57.3%. 1948 is the earliest year for which detailed data are available on releases from supervision.